I found this camera in an antique mall in Southwest Iowa. "Foto-Flex," made in Chicago, exact date unknown. I have every reason to believe it is from the 1940's, probably soon after the War. 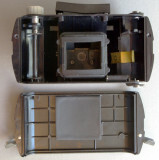 Waist level ground glass finder. Simple one speed shutter. SIMPLE one element lens. Fixed focus. Made for 127 roll film. This camera is of PLASTIC body, not bakelite... I mean it is the "Chicago" type plastic found in so many simple Rolls-type camera. But it is cleverly made, and light tight. Since 127 film is so difficult to find and to have processed, I modified it to accept a 35 mm film cartridge, just to see how capable that tiny simple lens might be. It surprised me... not too bad an image maker, especially in the central portion of frames. Remember to click on thumbnail images to see them enlarged. would otherwise have been consigned to the junk heap. Fine work, keep it up. I love the reflections of 'man over human' on #18.